Discussion in 'Community Events' started by nigegunz, Jan 6, 2019. Awesome race peeps. After a couple of spins my confidence was shot and couldn't keep up with the pace of the other LMP's. Had to pit twice, once for tyres, fuel and repairs and then again for repairs after a brush with the wall with only about 10 min to go. I came out of the pits the second time and saw the 3 GT3's still in a hard battle so I almost stopped at the end of pit lane to let them go, I then sat back and sat behind them to watch them battle it out for a lap or so - fantastic racing guys, congrats and respect. Well done to the podium of the two classes & thanks to @Flukyluke99 for filling the gap for Team FCR. Spidey_11 and Racepace like this. Have you got Benny in team gtr? He’s racing for bbb this year. 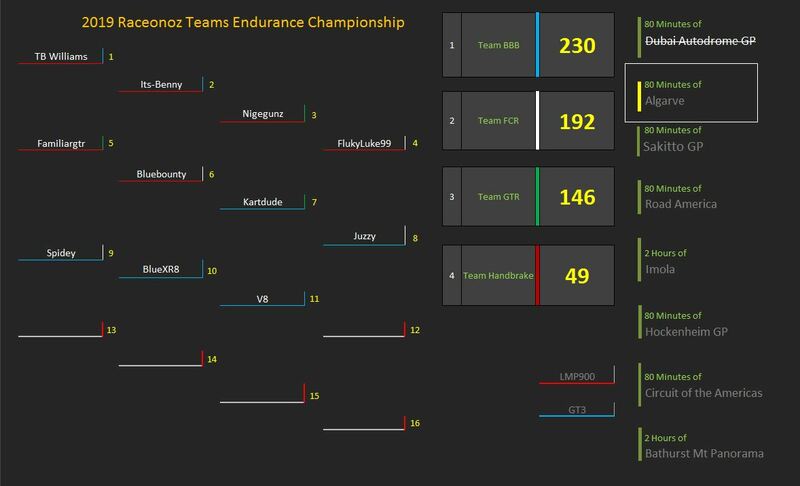 RaceOnOz Team Endurance Championship - Season 2 - Race 2 - Algarve. Make sure you watch the end of the race. Brilliant battle for the top step. v8power383, TheJuzzy, Aykay and 1 other person like this. Telum and v8power383 like this. Hey guys.. sorry been awol i know i expressed interest initially but then went ed and had to step away.. is still very much ed but after bothering f1 for the first time ever... i.miss racing now.. sounds like there's a spare seat if i ain't mistaken? there's a few seats available Kayne, an audi gt3 with GTR is one of them. pretty sure gary was in an audi as well & he's stepped aside. I wasn't there for round 1 so I'm not sure who was subbing for what team in round 2. was flukeyluke subbing for racepace @Spidey_11 at Algarve? Good to hear theres still some seats left, itching to get a good race in. Whats the ratio in classes atm? Cause I will automatically go on where there are less numbers tbh. Having one of your pro setups in the GT3 already sounds good though! I might go LMP? You had more lmps last race but the race before you only had 5? I'm happy with either but I know last season more people gravitated towards the GT3s than the Lmps? you can run the lmp for sure, we'll stick you in team handbrake (if they'll have you ) cause they've only run 3 cars so far & you've got a free pick happening there. GTR can now only field an Audi GT3 cause thats what Woody ran for the first race.